Orchard Lake – Summer is over and millions of Americans have already started checking items off their holiday shopping lists. But it’s not always easy to find the perfect gift for anyone and everyone, especially when we all want to give a unique gift that will be remembered year-round. With events such as the Holiday Craft Blast Oct. 8-9, shoppers can find custom-made, one-of-a-kind treasures created by local artisans. Choose from beautiful jewelry, delightful fragrant body lotions, handmade soaps, sculptures, carvings, paintings, pottery, framed art, and photos. Dozens of fine juried crafters will be at St. Mary’s School at 3535 Commerce Rd. in Orchard Lake featuring unique and high-quality gifts for everyone on the holiday shopping list. The event, presented by Art Fair Fun, is from 11 a.m.-7 p.m. on Oct. 8 and from 12-5 p.m. on Oct. 9. Admission is $3 for adults. Children age 12 and under are free. 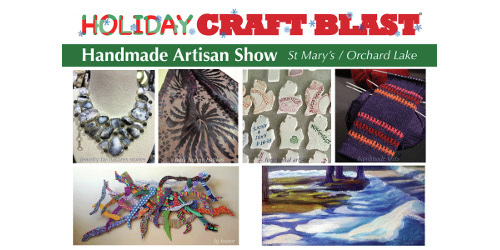 For more information, visit the Holiday Craft Blast website.